• an Irish national or resident. • for both motor and sail. • both coastal and inland*. • a practical test on the water. • a separate written CEVNI test paper. *Note: Inland means for use on those inland waterways of mainland Europe which have specific rules of conduct called the Code European des Voiles de la Navigation Interfere or CEVNI for short. It is not required for Irish or UK inland waters. There is no ICOPC course as such; the ICOPC test is done by completing a direct assessment. However, we would be happy to run a short pre-assessment training session for a group who feel they would benefit by doing one before undertaking the actual assessment. What used to be called the International Certificate of Competence, or ICC for short, is now called the International Certificate for Operators of Pleasure Craft (ICOPC). However the abbreviation 'ICC' is still commonly used and understood. Regulated by Resolution No. 40 of the United Nations Economic Commission for Europe the ICOPC is intended to indicate competence for users of leisure craft sailing in day light hours and ‘allows’ the holder to voyage internationally in the coastal waters of a country which has accepted UN Resolution No.40. Ireland and the UK have accepted the ICOPC but many European countries have not, or have yet to decide, and some countries have only accepted parts of the ICOPC or have not accepted some of the updates as yet. In our experience however most European harbour and marina authorities seldom demand documentary proof of a skipper's competence although this attitude appears to be changing somewhat in recent years. Carrying an ICOPC is a sensible precaution and in some countries may be essential. An ICOPC may also be acceptable as sufficient proof of competence required by boat charter companies, but it is important to check with the charter company before booking. In Ireland the ICOPC is administered by Irish Sailing on behalf of the Irish Government and is valid for power or sail, or both, for vessels not exceeding 24m or 80 gross tonnes but other jurisdictions may have different mandatory restrictions which must be complied with by vessels using their coastal waters. 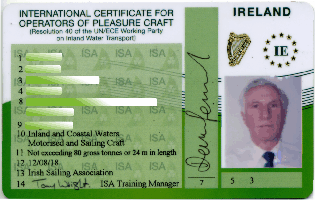 An Irish ICOPC can be issued without a test to someone who holds a valid IS/ISA certificate from a practical course or exam such as a Powerboat, Day Skipper or Yachtmaster certificate. An ICOPC cannot be issued to the holder of a shorebased course certificate or to the holder of a practical certificate from another jurisdiction, such as an RYA certificate for example. Anyone who does not hold a qualifying certificate must complete a practical test on a suitable boat. Most people will need the Coastal endorsement which requires a written test in addition to the practical test. If you are doing the sail test on a yacht with an engine you might as well do both the power and sail test at the same time. David is an IS Yachtmaster examiner and can run the ICOPC assessment and the Coastal and CEVNI endorsements in your suitably accredited Irish Sailing (Irish Sailing Association) club or organisation.